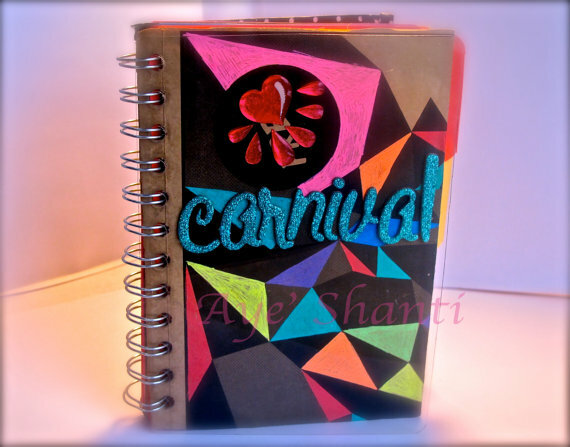 The Carnival season fills us with so much excitement that we just feel like giving away to share the joy! The music is hype, the costumes are gorgeous and the fetes in New York have us ready for ACTION! 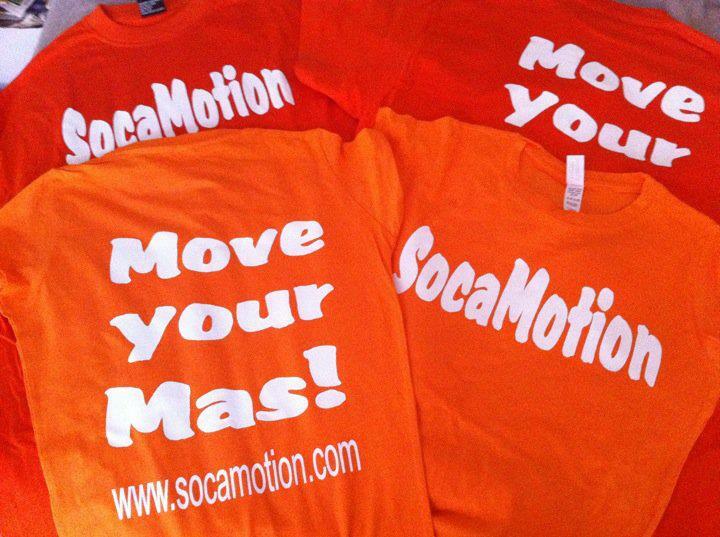 So we are offering a giveaway of our signature “Move Your Mas” t-shirt in orange, blue or black in your size of regular or baby doll styles as well as a Carnival Brag Book by Aye Shanti that helps you collect your carnival memories on its colorful pages. The contest will begin today (Wednesday 8 February) and end on Friday 10 February at 12 midnight. The winner will be selected at random and announced this Saturday and the prizes will be sent to you. Win a signature Socamotion t-shirt! ~ Email info@socamotion.com to submit your comments directly. The SocaSLIMDOWN™ Weight Loss Challenge is a program created and developed by Onya West in August 2010 as a way to motivate people to lose weight using fun Caribbean workouts with SocaMotion and tasty Caribbean recipes gathered and created by Ms. West. The following is some of the rules that were posted on the website http://www.SocaMotion.com for full disclosure as the first challenge has now ended and a new cycle will soon begin. ~ The official start to the SocaSLIMDOWN will be on Saturday, 2 October, 2010. The final weigh-in will be on Saturday, 26 February 2011. This challenge lasts for 5 months to discourage crash dieting and will support SocaSlimmers through the holiday season when temptations are high. Persons can register at different points in the Weight Loss Challenge but the registration fee will change accordingly. ~ Participants will undergo in a private weigh-in and will record personal wellness goals that can be shared with the group. The actual weight recorded will be kept confidential among SocaMotion Instructors. The 3 Finalists will qualify decided based on total percentage of weight lost between the first and final weigh-ins and progress based on percentages only will be shared with members of the private Facebook group. The Winner will be decided based on a vote among those who participate in the SocaSLIMDOWN. ~ Participants in the SocaSLIMDOWN will be able to attend SocaMotion classes at discount prices. ~ No purchase of products is necessary to participate in the SocaSLIMDOWN. ~ Additional workshops will be provided by local experts in wholistic care and members of our Preferred Provider Network. ~ In order to qualify for the grand prize, you must conduct an initial weigh-in and participate in monthly meetings in person or online. – In person: You must attend be weighed-in and measured during your first meeting and attend at least one (1) SocaSLIMDOWN meeting each month. Meetings are held every 1st Saturday and 3rd Friday of the month. You must also submit a journal entry or comment online on Facebook or SparkPeople. – Remote/Online: You must conduct one real-time weigh-in and measurement through online chat on Skype, Gmail or MSN Messenger and submit at least two (2) online journal entries or comments on Facebook or SparkPeople. There is an additional $10 fee for this option. ~ There is a one-time fee for participation of just $40 $20 of this amount will be used towards the cash prizes for the SocaSLIMDOWN Winners. The remnant of the money will be used towards rental fees and administrative costs for conducting the SocaSLIMDOWN. SECOND RUNNER-UP ~ $100 cash* and 5 FREE fitness classes at SocaMotion. 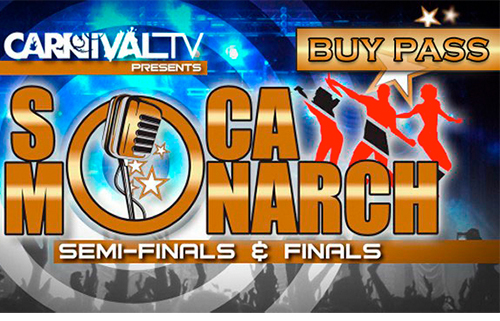 ~ The Winners will be announced through SocaMotion online networks on Facebook, Twitter, YouTube, and our website as well as on the radio on Saturday, 26 February, 2011. ~ Rules are subject to change at any time by SocaMotion Fitness and Wellness. * CASH PRIZES are dependant on the number of persons enrolled in SocaSLIMDOWN. For example, if 30 people enroll, the Grand Prize will total $300, the First Runner Up will receive $200 and the Second Runner Up will recieve $100. The prize will be reduced if less people enroll but will maintain the same proportion. We have reached the half-way point in the SocaSLIMDOWN™, a weight loss challenge put on by SocaMotion™ to encourage healthy weight loss featuring Caribbean cuisine. The challenge lasts for 5 months and has a great grand prize of a 5-night stay at Birdie’s Nest Guesthouse in Tobago that is the motivating force for most who enroll, but there are also monthly prizes to share the good fortune and level the playing field.